Please welcome author/illustrator Rosie Russell to Frog on a Blog. 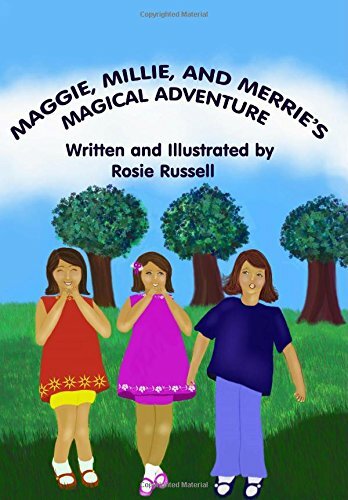 Rosie is a former teacher who now creates children’s books full time. I love that she donates a portion of profits from her book sales to great causes! Rosie stopped by today to offer tips on writing books that young readers will love. I love picture books! 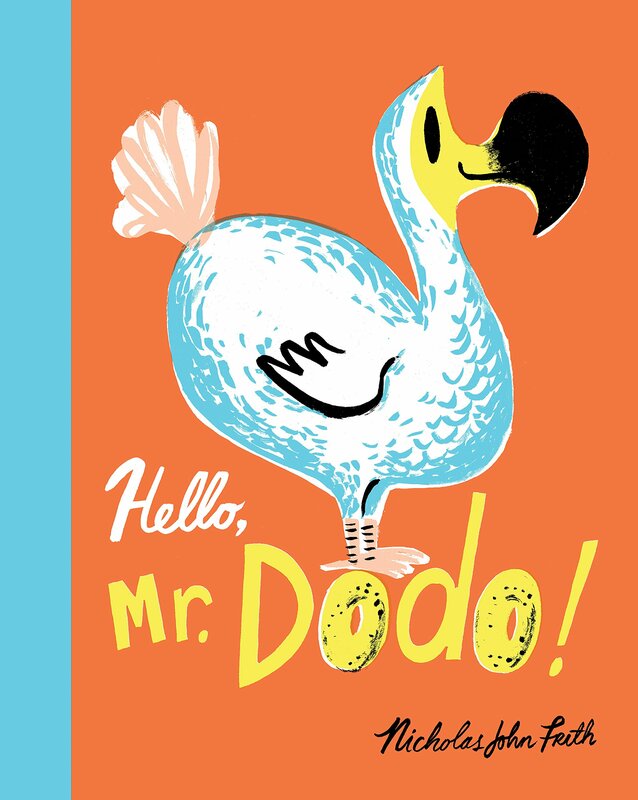 Reading them to children and exploring how the author and illustrator came up with their story fascinates me. It’s the drive and passion that started my job as a full-time author and illustrator. I’ve had many people tell me writing picture books must be easy. I wish I could tell them it is, but it’s very hard. 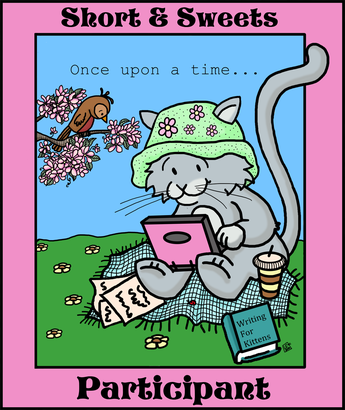 Coming up with a tale that young readers will enjoy and finding important elements to work with, are the keys to success for creating entertaining books. I base most of my books on something or someone in my life. Either it’s a memory or event that was personal or topic a child will love reading about. It’s great to come up with a theme outside of your own experience. When doing so, make sure you incorporate your own voice in the story, along with lots of research on the subject. 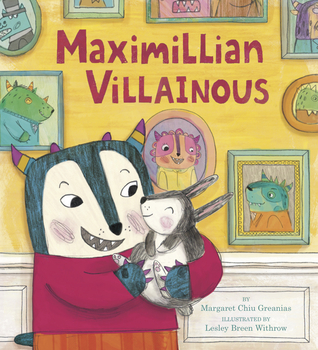 Make your books engaging with colorful illustrations. Children love bright colors, so use them often. I made one that has a darker cover. 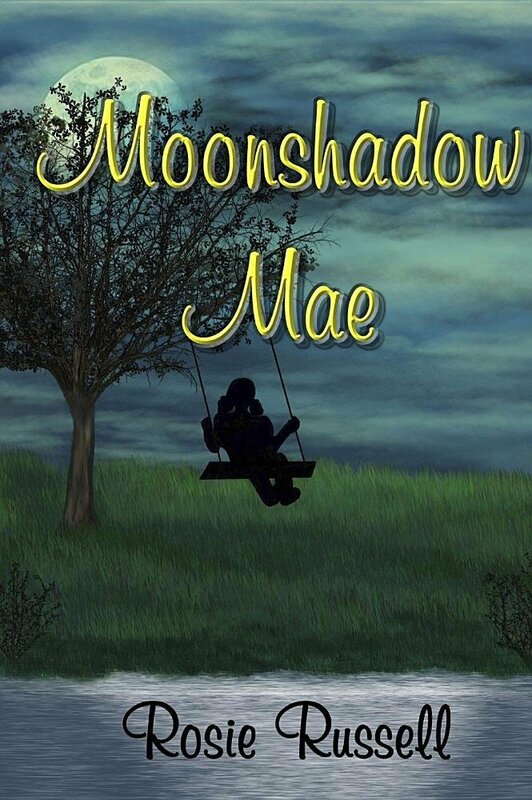 It’s called Moonshadow Mae. I ran a survey with my fans and they voted for the image. They liked how it looked more intriguing and mysterious. The inside illustrations are much brighter. The story itself is about a young girl named Mae that loves and adores the moon. It’s my first hardcover with a Library of Congress number for those that wish to add to their libraries and stores. It’s also available in paperback. 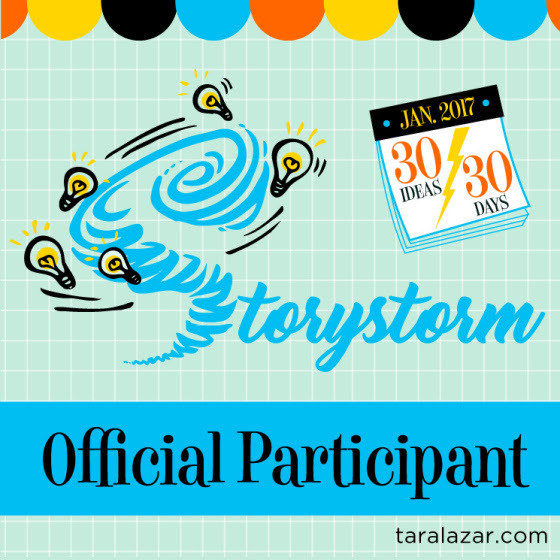 Add information for a more interactive story. Another tip readers love: Have an interactive story or information with fun things to think about or do in the back of the book. 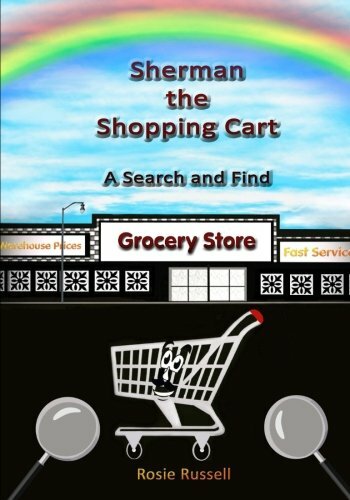 Many of my books include activities, fun projects, and recipes. A few of them have added questions for further learning. 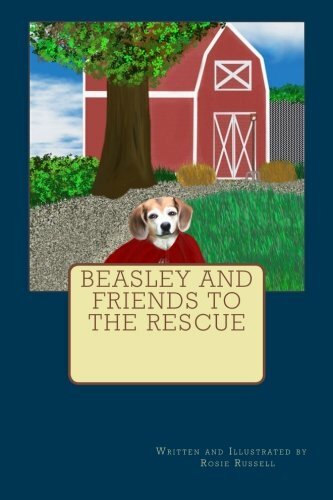 In Beasley’s Journey, I’ve included simple questions the reader can answer, and an important tip for pet owners. For Beasley and Friends to the Rescue, I’ve included pictures of the real live pets, each character is based on. 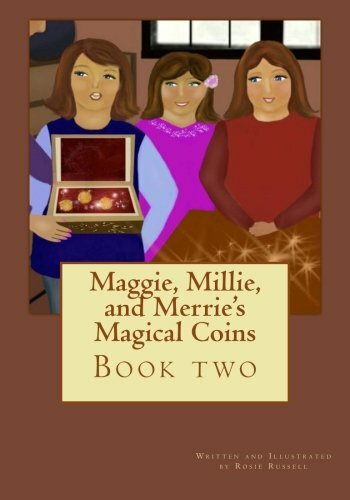 For my Maggie, Millie and Merrie series, I include art projects, recipes, and fun things to do at home. 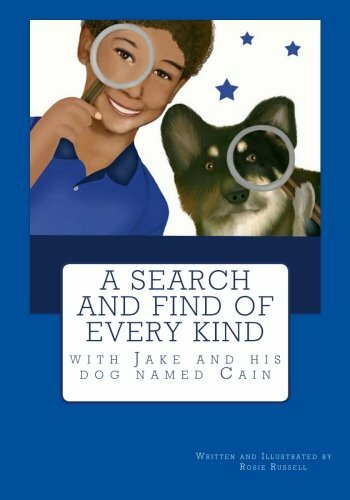 My two Search and Find books show over a hundred things to find: Picture finds for non-readers, and word finds for readers. Children love it when a character’s voice is heard through the dialogue. Change up the voices in a read aloud to convey their special traits. Thank you for having me as your guest today. Thank you for stopping by, Rosie! Rosie Russell is the author and illustrator of eight children’s books. She has studied Early Childhood Education and has taught students in elementary and middle school for fifteen years in the Midwest. 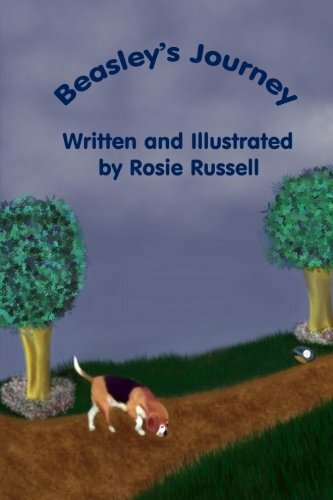 Rosie now writes and illustrates full time and is looking forward to sharing her books with students, encouraging them to write and illustrate their own stories. A portion of profits from her books will be donated to different causes, depending on the subject of her books. Please welcome picture book author and elementary school librarian Nadine Poper to Frog on a Blog! Nadine serves on the committee for the Pennsylvania Young Reader’s Choice Award. She’s stopped by today to share a bit about this special award, sponsored by the Pennsylvania School Librarians Association, that allows the students to vote for their favorite books. The students of Pennsylvania are gearing up to vote in their very own book award, the Pennsylvania Young Reader’s Choice Award (PYRCA). 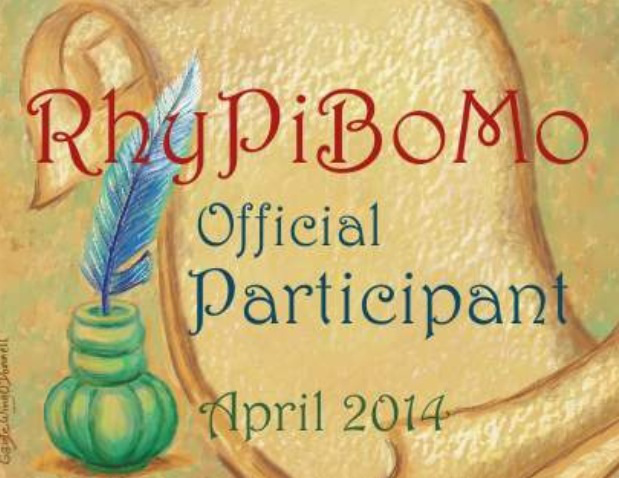 There are 4 lists created each year by 24 PA school librarians, grades K-3, 3-6, 6-8, and YA. 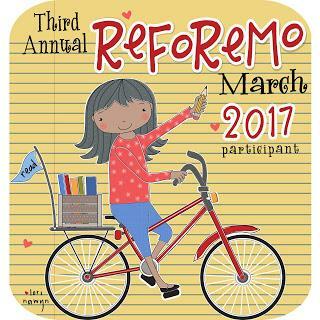 Each list has 15 books on which students can vote for their favorite, one per list. 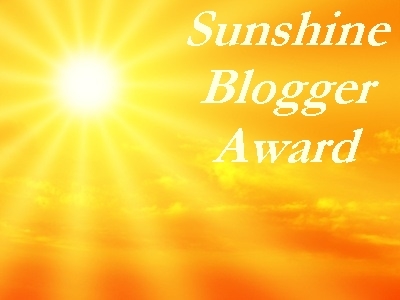 The book with the most votes from each list is the winner. The votes are cast by the students of Pennsylvania. The lists are carefully balanced to include all genres: picture books, poetry, chapter books, middle grade, biographies, and nonfiction, as well as a variety of topics and characters that will appeal to both boys and girls and that celebrate various cultures. Students will place their votes by March 15, and the winning books are revealed at the annual Pennsylvania School Librarians (PSLA) Conference. Winning authors from the previous year often attend the awards breakfast at the conference to receive their recognition. School libraries across the Commonwealth participate by purchasing the books for their collections, sharing the book talks, book trailers, and lesson ideas with their students. 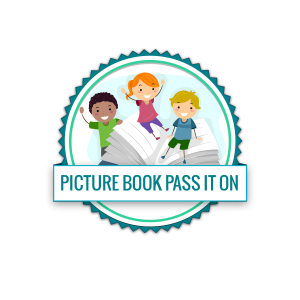 The book talks and lesson ideas are created by the committee members so that teachers and librarians have resources at their fingertips. One lesson idea, for example, that I incorporate with my elementary students involves students taking on the roles of animals in the ocean and demonstrating the break down in the food chain as discussed in If Sharks Disappeared by Lily Williams. My students enjoy participating each year because it is a book award where their voice matters. 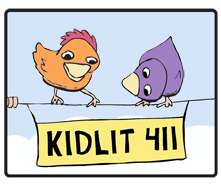 I do a big Caldecott and Newbery award unit also, which we have so much fun with as well. However, the kids know that those awards are chosen by adults, where as the PA Young Reader’s Choice Award is all about what they like the most. For more information and to see a complete list of all 2018-2019 books, visit the PYRCA website here. 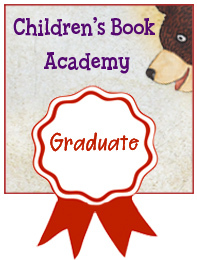 Most states have their own children’s book awards. Click here for the current list in your state. Nadine Poper is an elementary school librarian for an urban PA school district, a mom to 3 amazing young men, a wiener dog owner, and foster mom for homeless dachshunds. She uses the proceeds from her dachshund picture books to help support dachshund rescue. As a school librarian, Nadine serves on the committee for the PA Young Reader’s Choice Award. Nadine’s traditionally published debut picture book PORCUPETTE AND MOPPET will be released June 2019 by Blue Whale Press. Her second picture book, RANDALL AND RANDALL, will be released Fall 2019. Visit her at www.nadinepoper.weebly.com. 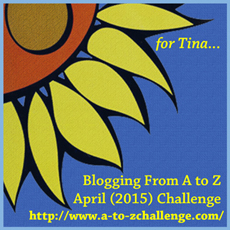 Please welcome back to Frog on a Blog author and mom Ilham Alam. 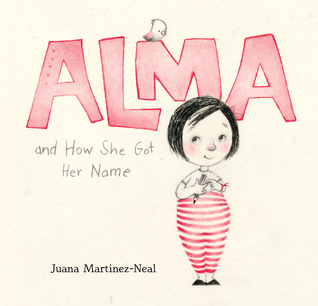 This past September, Ilham shared her Top 5 Books for Kids to Learn ABC’s. Today, she’s stopped by with another wonderful list: 5 Best Culturally Diverse Picture Books to Read Now. 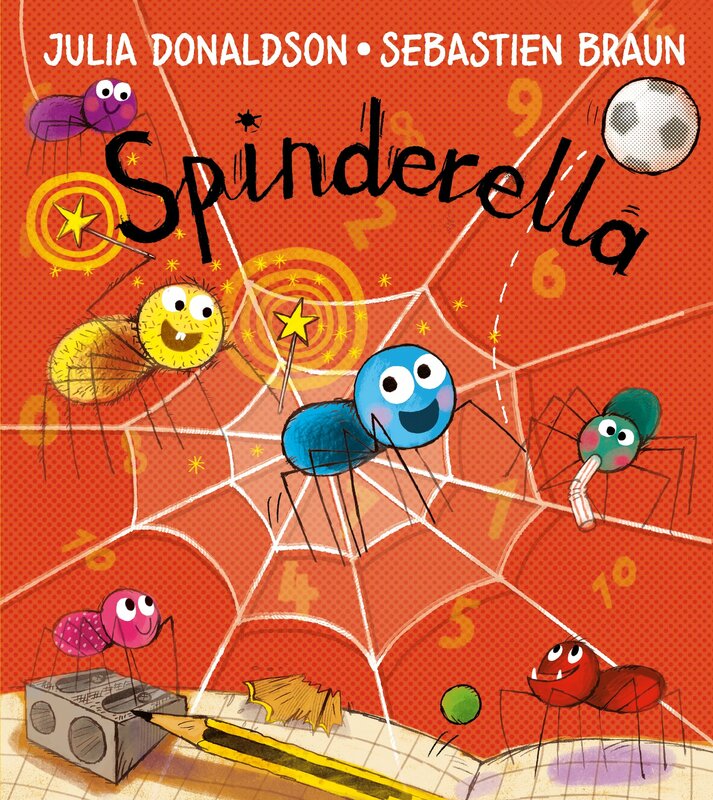 This is one of the books that I always recommend for kids and is a perennial favourite for many reasons. It teaches diversity and acceptance through the means of the oft-misunderstood Hijab, or Khimar. Through the eyes of a little girl, we can see her love for her mother and her mother’s many beautifully coloured khimars. We see the reasons why this little girl and her mother choose to wear the khimar, and cultural reasons are only one part of it. I also love that it depicts diversity in relationships as it appears that her parents have an inter-religious marriage, yet family members with different religious beliefs still love each other all the same. Read the book to find out what her favourite color of khimar is. Written by the writer of the celebrated novel, Kite Runner, this poem has been written as a dedication to the refugees from Syria and likely inspired by the story of Aylan Kurdi. 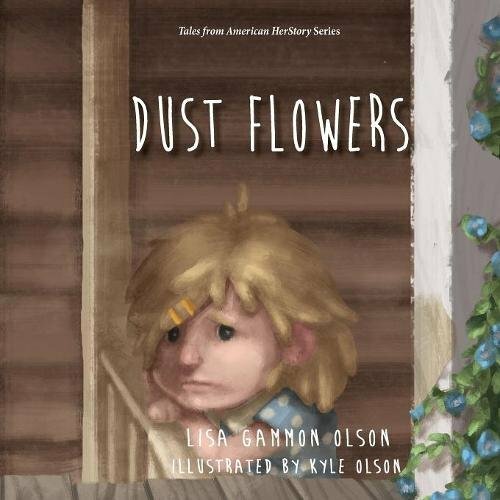 In wispy and haunting pictures with short but powerful verses, we see the story of a boy and his family who had a lovely life in Syria prior to the current Civil War. Then comes their decision to flee using the dangerous Mediterranean crossing, just for a fighting chance to reach safety in Europe. Before they get into the boat, the father whispers a sea prayer to his son, who’s asleep in his arms and unaware of the perilous sea journey that he’s about to take. If nothing else, this book will fill you with compassion for their plight. This is an untold history of NASA’s Apollo 11 mission and should be read by all kids, especially girls from diverse communities. These 4 pioneering African-American female engineers/mathematicians, are wonderful role models, as these women displayed intelligence, grace, talent, and courage, to become the first women of colour to be employed at NASA as scientists. These women worked on the historic missions, which successfully sent the first American man into space, the first people ever on the moon in 1969, and vastly improved the safety of commercial airplanes. And these women made their astonishing achievements at a time of segregation among races and when women, especially black women, had little access to higher education. This is the African version of “Old Macdonald had a Farm, E-I-E-I-O.” Younger kids will love the familiar sing-a-long, but with different animals, and older kids will love learning about the different animals that are found in the African continent. All will love the rich yellows and browns showing Mikamba, his animals, and his village. 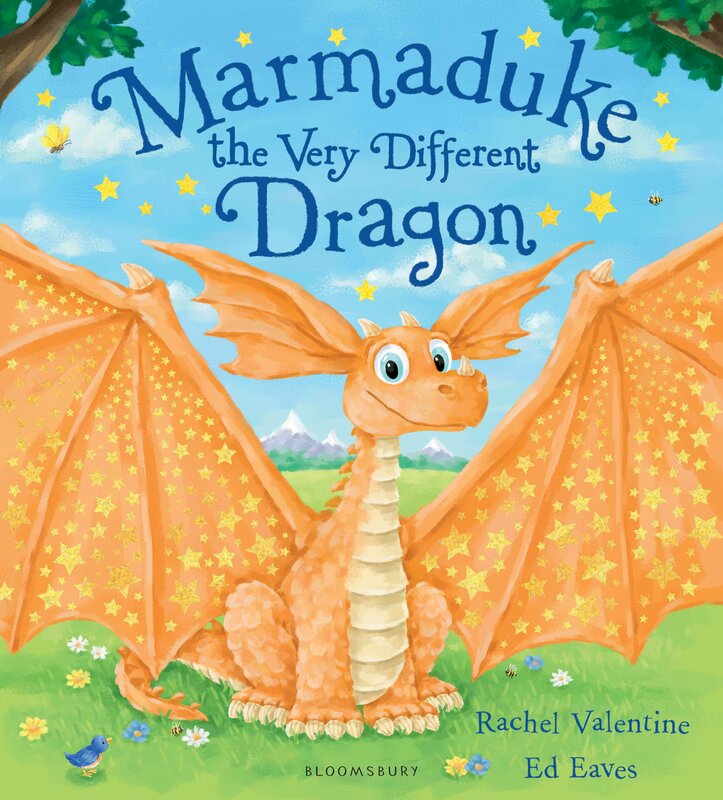 This is a clever retelling of the age-old nursery rhyme by Rachel Isadora, meant to teach us something about another part of the world. Who doesn’t know of Malala Yousafzai? She is the brave young woman who was nearly killed for speaking out in support of girl’s education and equality between the genders. In simple sentences, Malala expresses her desire to rewrite her society with her pencil. In beautiful painting-like images, Malala shows us what her life was like in the deeply conservative part of Pakistan that she is from, the lack of safety and security, her home and family, and the lost potential of her female peers being denied schooling. This book is not only autobiographical, but inspirational, as kids can see what Malala’s determination and courage eventually got her: the right to an education. Kids here will be a bit more thankful that there is universal public education in the West and that it is their birth-right to get quality education, when they read about Malala’s hopes and sacrifice. Ilham Alam is a married mom of 2 from Toronto, Canada and an avid reader of most genres. As a dedicated bookworm, she has been on a mission to turn her 2 boys and her cat into dedicated readers as well (she’s making good progress). She also has her upcoming picture book, Wonder Walk, being published by Iguana Books in Spring 2019. You can pre-order your copy of Wonder Walk today and also multiple perks to go with it for a limited time only. Aviator Owl Books co-founder Sarah Porcher is a young woman who has impressed me greatly with her creativity, generosity, ambition, and seemingly boundless energy. 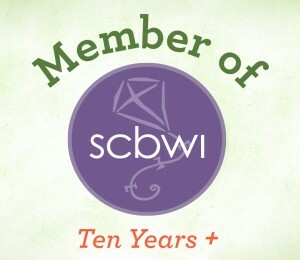 She first appeared on Frog on a Blog last summer and shared how she started Aviator Owl Books. She also said that the goal of Aviator Owl Books is to “inspire and educate children through print books, eBooks, online games, and apps”. And as if that isn’t enough, Sarah and her co-founder Chris Bill support charitable causes, such as First Book and the Make-a-Wish Foundation, through their book sales. You can read my interview with Sarah by clicking here. Sarah is back to take us through her fascinating illustration process for her new book The Aviator Owls and Mina’s Garden. (As a writer, not an illustrator, I’m always intrigued by the art techniques that illustrators use for their books.) Take it away, Sarah! Hi everyone! I’m so happy to be able to share some of my illustration techniques for our new book The Aviator Owls and Mina’s Garden! I’ll start with a brief introduction. My name is Sarah and I’m co-founder of Aviator Owl Books Inc. where I write and illustrate the books under the pen name S. A. Porcher. Today I’m going to talk a little bit about how I illustrated our newest book The Aviator Owls and Mina’s Garden, which is to be launched April 24 (2015). So let’s get started! First, if you’ve seen any of our books before you’ll know that we have two different illustration styles: one using flat designs and vectors, and one with a digital painting technique. For any book with Aviator Owl characters, I use vector illustrations, so this post will be about that process. I begin all of my illustrations with simple sketches on plain printer paper. I prefer to use ballpoint pens, but occasionally I’ll use pencil. The Aviator Owls were born on paper in 2009, so the basic character sketches have been finished for a long time. That made the illustration process for this book a little more streamlined. 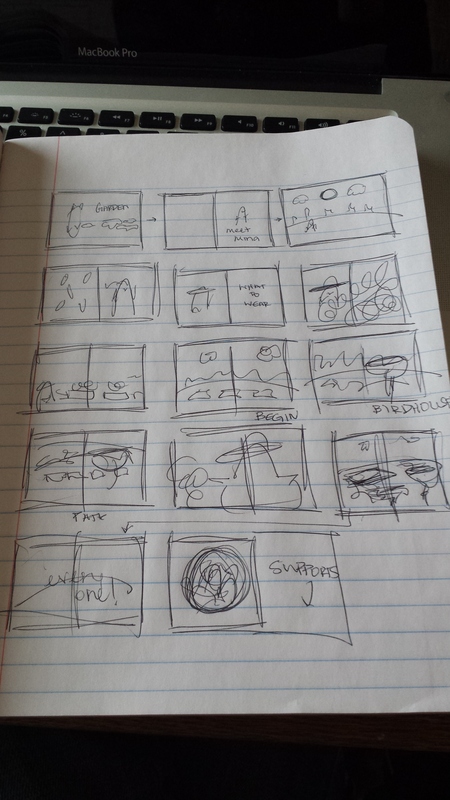 After the character sketches are complete, I’ll sketch out extremely rough layouts for every spread in the book. And by “extremely rough” I mean that the only person on the planet who can understand them is me. Then I will organize them into a storyboard just to get a sense of the storyline. After this I have two options: 1. 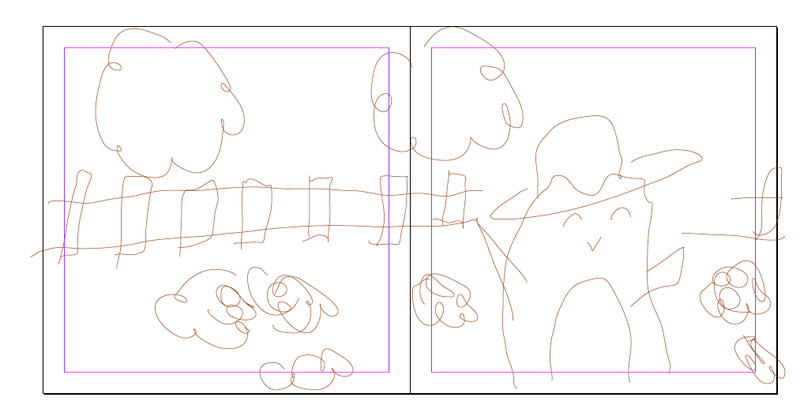 I scan in the rough layouts and add each one to a spread in Adobe InDesign (InDesign is my best friend) or 2. I use my Wacom Bamboo tablet and the pencil tool in InDesign to sketch the storyboard in by hand, using the physical sketches as a guide. Having the spreads in InDesign helps me a lot because as I fill in the illustrations I can scroll down and remind myself where I’m going next. Next up is starting a spread. I don’t start at any one in particular, I just sort of randomly choose. Now, because I have been working with the Aviator Owls for a long time, I am usually able to adjust them in Illustrator without having to refine my sketches too much. With a new book with new characters, at this point in the process I would have to pull out a pen and paper and sketch out a much more refined spread to use as a guide. But not the owls. Usually at this point they tell me where they want to go (It’s quite nice. I barely do anything at this point)! 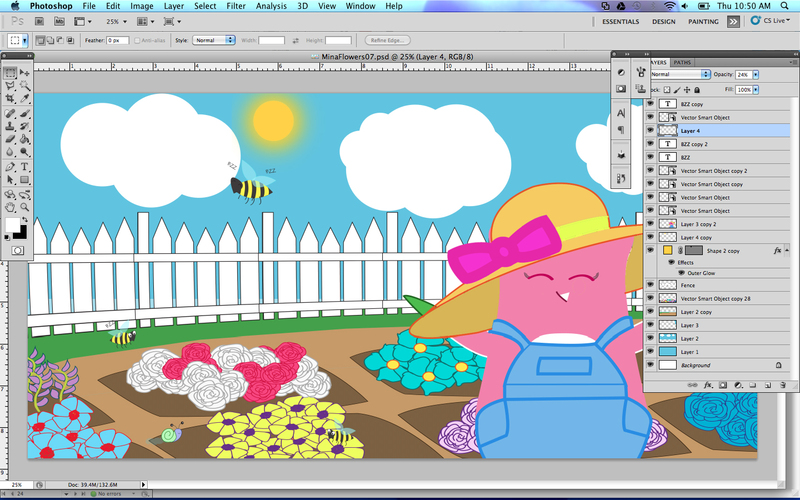 I open Illustrator and start a new document, which I will save immediately as “Mina’s Garden”. 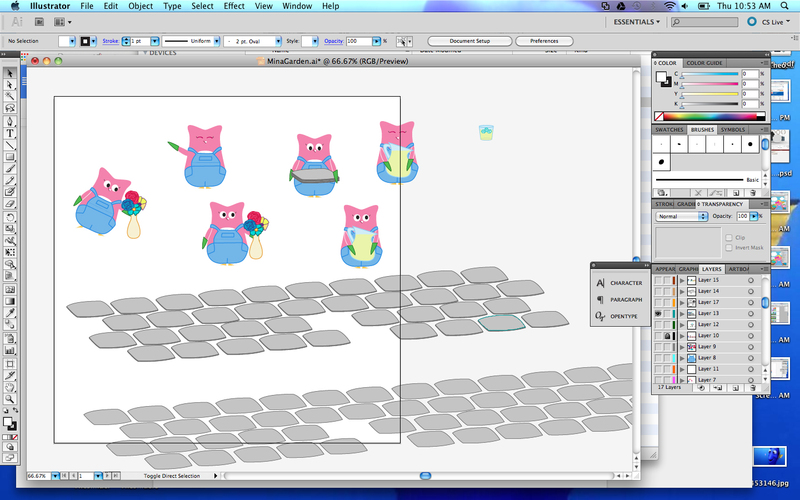 Then I’ll open any document that has the owls I already designed and copy them into the new document. I work in layers in Illustrator, so I’ll use the same document for the entire book, but every new page will be on a different layer. The tool I probably use the most is the pen tool, and I’ll create (using my Wacom tablet) all of the vectors that are needed for the page. I pop over to Photoshop and start a new document with the correct dimensions for the book (Aviator Owl Books are all 8.5” x 8.5”) and copy in everything I need. I do touch-ups in Photoshop and then save the document. Unlike in Illustrator, in Photoshop every spread gets its own document. I try to keep these as organized as possible. Every book gets its own folder, and the Illustrator, InDesign and Photoshop documents are all dropped there. The Photoshop documents are named “MinaBook01” through “MinaBook14” so I can find it all later. Then it’s into InDesign. Command + D lets me place the Photoshop documents into InDesign. 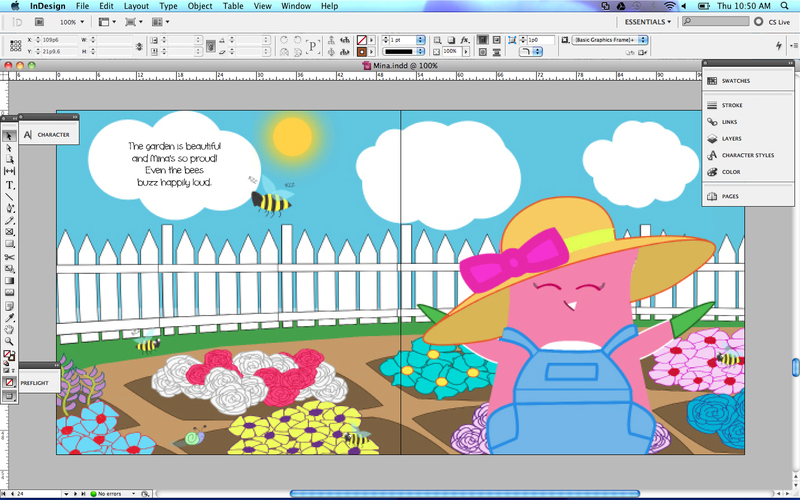 This entire process – from Illustrator to InDesign can take several weeks – sometimes months – depending on the complexity of the book, the number of new characters/objects, and, of course, my schedule (I am still a full-time college student). 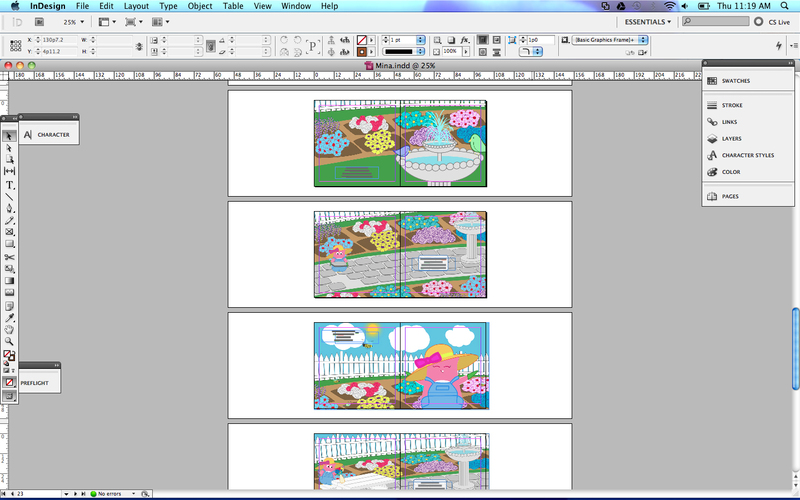 I am generally a very impatient person, so as soon as I finish a spread in Photoshop, it goes into InDesign. Spread by spread, the rough sketches in InDesign turn into the Photoshop images. When I’m coming close to the end of the illustrations, I’ll start to fill in text. At this point it’s easy because I’ll have been working on the manuscript since the illustrations began. I’ll use the text tool in InDesign and write directly on top of the images. If something doesn’t fit well, or the text seems too out of place or “just three pixels too far to the left” (yes, I am that kind of person), I’ll go back into Photoshop and adjust the image to better incorporate the text. When it’s close to its final stage, I’ll export a low-res file and send it to the other co-founder of AO Books so he can look over it and bring a new perspective. Out of the entire process I think this is one of the most important parts. I am just one human, and after looking at the same project for several weeks it becomes very easy for me to miss things. Usually Chris will look over it and send back comments and we’ll go over them together. This back-and-forth will go on for as long as it’s needed. When it’s complete I’ll add the “book” information – ISBN (which I purchase from Bowker), the cover page, the pages dedicated to the charity we’re supporting through that book (for Mina’s book it is DIG), and then we send it out to CreateSpace for a proof copy. Click the Logo to learn more about DIG. And that in a nutshell (okay, a very big nutshell) is my illustration process for vector illustrations. I hope you enjoyed learning about how I illustrate, but if you have any questions or comments, please feel free to ask them here, or contact me at saporcher050@gmail.com. 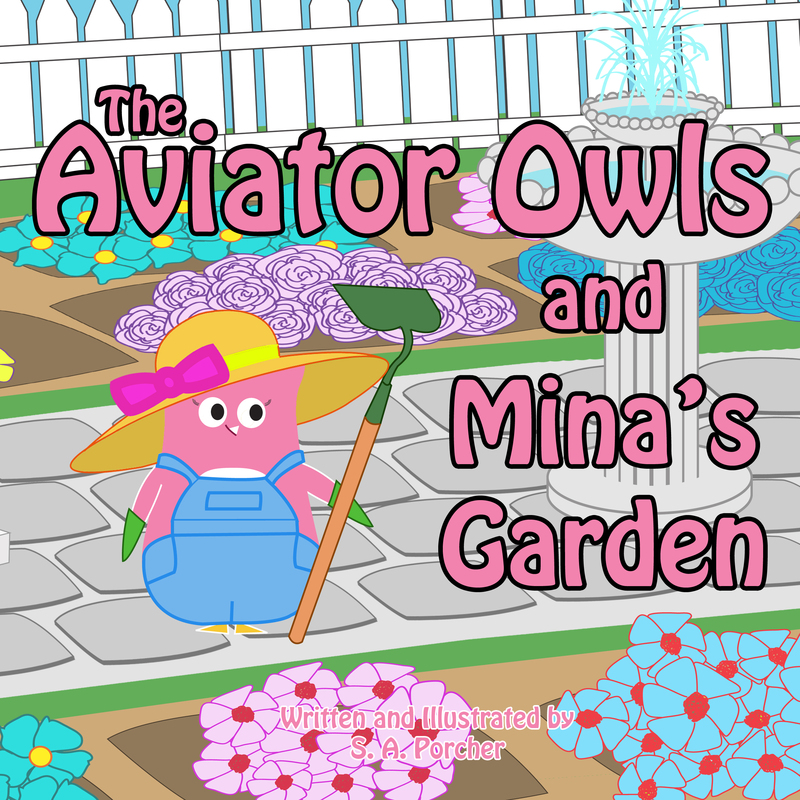 And for more information on Aviator Owl Books, be sure to check out our website at aviatorowl.com where you can find free printable activities, all the books, and news about The Aviator Owls and Mina’s Garden, due out April 24th, 2015.